President Trump is sending thousands of troops to the U.S./Mexico border in an effort to deter a caravan of migrants seeking asylum in America. 1) This caravan of migrants is part of a humanitarian crisis and the president is savagely exploiting it to incite his conservative base ahead of Tuesday’s midterm election. 2) This caravan is a horde of criminals intent on bringing crime and disease into our country. But I’m not going to tell you either of those things. You almost certainly have your own opinion and feelings about it and I’m not going to argue either way. What I want to talk about is solutions — solutions to a mass migration problem that's global. Make no mistake, the United States isn’t the only country facing an influx of asylum seekers. Long, bloody, devastating wars in Syria, Ukraine, Yemen, and elsewhere have led to a huge rise in mass migration. 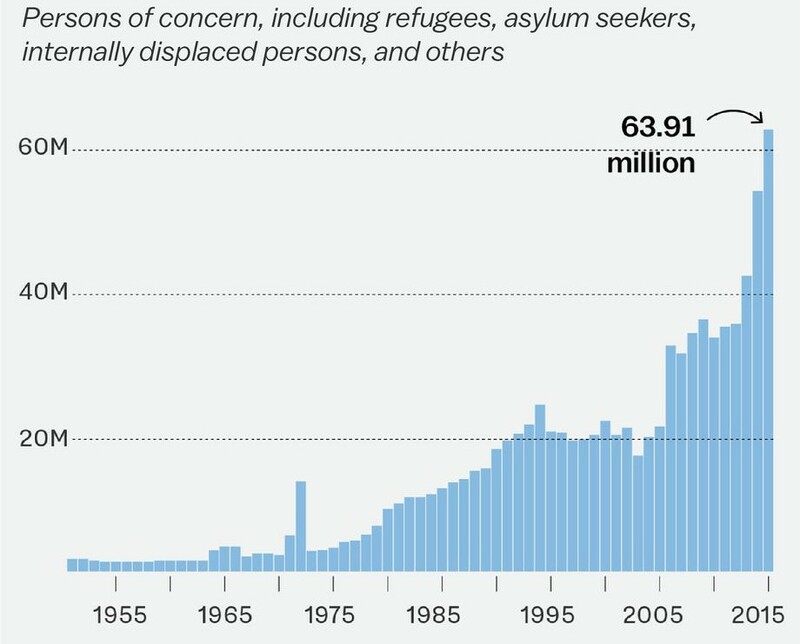 Since 2000, the number of refugees, asylum seekers, and displaced people worldwide has tripled — rising from 20 million to more than 60 million. In 2015, some 1.3 million asylum seekers fled to Europe and applied for protection status. These were people displaced by the Syrian civil war, the collapse of the Gaddafi regime in Libya, and ISIS. And prior to recent events, the U.S. experienced a similar migratory crisis in 2013/14, when hundreds of thousands of children fled from their homes in Central America. From October 2013 to September 2014, 68,541 unaccompanied children were apprehended at the US/Mexico border — a 77% increase over the previous year. Again, this is a global problem, but it’s now being felt rather acutely in the United States, where the controversial policies of the Trump administration have brought the issue front-and-center. Those policies include family separations and “a wall” of troops stationed at the border. Again, I’ll leave you to draw your own conclusions about the morality of those policies. But I am going to tell you this: There’s a better way. Right now, I have two companies in my Wealth Warrior portfolio that I recommended based largely on their immigration solutions. The first is a company that makes secure ID cards — drivers' licenses, electronic passports, visas, etc. That means physical IDs, as well as secure digital IDs, including mobile identification and paperless processes. These are crucial in the age of terror and migratory crises. That’s why this market grew from $7.6 billion in 2016 to $8.5 billion in 2017. And it’s set to grow further, to $10.6 billion in 2018 and $11.2 billion in 2019. You'll Never Be On The Inside! So join Outsider Club today for FREE. You'll learn how to take control of your finances, manage your own investments, and beat "the system" on your own terms. Become a member today, and get our latest free report: "World Economic Collapse: Grow Your Wealth in A Bear Market Epidemic"
After getting your report, you’ll begin receiving the Outsider Club e-Letter, delivered to your inbox daily. But perhaps more importantly, the company I recommended also makes tracking software. First, under the Obama administration, asylum seekers were allowed into the country in accordance with U.S. and international law. However, with so many refugees flooding in, there simply weren’t enough accommodations to detain them until they could go through the proper court proceedings. So they were released, and asked to reappear for their hearings — something many failed to do. This is called “Catch and Release” and President Trump is not a fan. His solution is to instead build tent cities to house these would-be immigrants. One problem there, though, is that tent cities are not, in fact, cheap. The one tent city currently operated by the federal government is projected to cost $367 million in just the final three months of the year. That comes out to roughly $1.5 billion for a full calendar year of operation. That facility (located at the Tornillo Port of Entry in Texas) currently houses about 1,500 unaccompanied migrant minors, and was recently expanded to make room for up to 3,800 beds. By comparison, the two large migrant caravans traveling through Central America and Mexico right now are believed to have a combined 6,500 people. Another problem with the tent city tact is that federal judges have repeatedly ruled that it’s illegal to detain families indefinitely. Why not use tracking software instead? The company I recommended makes exactly those products, which are currently being used to monitor prisoners under house arrest. In my view, this is the most humane, pragmatic, and cost-effective solution. Asylum-seeking immigrants can’t be freed to disappear into society without being vetted and documented. Yet courts have determined families can’t be detained indefinitely. And tent cities are expensive and impractical. I think, going forward, electronic tracking is going to be the compromise at which policymakers arrive. I doubt Trump will pursue it. He clearly favors less subtle, more aggressive solutions. But frankly, I don’t think tent cities and a wall of soldiers is tenable. So if you want to find out more about the company I recommended to readers, which also provides cybersecurity solutions for businesses and governments, you can click here. And if you sign up for The Wealth Warrior, you’ll also get access to another stock pick I made — which is the company that’s worked for the Department of Health and Human Services’ Office of Refugee Resettlement (ORR) since 2000. This company handles all the bureaucracy — the data collection and distribution — of America’s refugee resettlement apparatus. That includes medical services and family reunification, among other things. Both companies are currently rated as ‘Buys’ in my portfolio and are actually trading at steep discounts in the wake of October’s brutal market sell-off. Jason Simpkins is Assistant Managing Editor of the Outsider Club and Investment Director of The Wealth Warrior, a financial advisory focused on security companies and defense contractors. For more on Jason, check out his editor's page. *Follow Outsider Club on Facebook and Twitter. So, join Outsider Club today for FREE! You'll learn how to take control of your finances, manage your own investments, and beat "the system" on your own terms. Become a member today, and get our latest FREE report: "Three Big Profit Opportunities in Solar"! Volatility, Rates, the Dollar... and Europe? The marijuana industry has rewarded scores of investors with life-changing gains. But this new industry is just getting started, and discerning the winners from losers is a tall order. Our latest report on investing in the marijuana sector removes all complication, as we guide you to the winners and away from the losers. Learn everything you need to know about navigating and profiting in this new industry. Become an Outsider today, and receive this report FREE! Sign up to receive your free report. After signing up, you'll begin receiving the Outsider Club e-letter daily. The Outsider Club is a group of people ready to take our finances into our own hands; to manage our own investments; to not give into a system that skims off the top until it's time for you to retire. We offer expert opinion and guidance on saving, retirement and financial planning, taxes, investments, and generally how to financially thrive on your own, independent of the banking system and government. We'll also help you shield your civil liberties and freedoms. We pledge allegiance to no political party. © 2019 Outsider Club. All rights reserved. If you've been watching the market hit new highs and wondering if you should be back in...DON'T! This FREE report explains why the market is set up to drop big...and how you can avoid it. Get your report today...and become an honorary member of the Outsider Club.